Countertops set the tone for the kitchen, so choose materials and a look that not only reflect your style, but also are in line with how you use the kitchen. Granite is on the must-have list for many homebuyers. But engineered stone products made primarily of quartz are replacing granite in high-end design today, and their functionality as a stain-resistant, durable, sleek-looking surface fulfills lifestyle and aesthetic prerequisites for many. Burgin says half his clients go with granite, and half go with a quartz surface. Jorge Castillo, whose clients want modern kitchens, chooses quartz for its consistency. He would rather the focus be on a dramatic statuary marble backsplash than the work surface. “One of the reasons I like CaesarStone and Cambria is because it doesn’t make the kitchen busy,” he says. Meanwhile, concrete has come a long way. With more colors and a sleek finish, today’s concrete surfaces are more durable. Crushed glass surfaces provide an opulent focal point. Here’s a wrap-up of workspace surfaces and how they stand up in the kitchen environment. 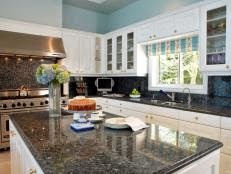 Keep in mind, countertops may dictate the kitchen design and are sometimes chosen before cabinetry. Granite. 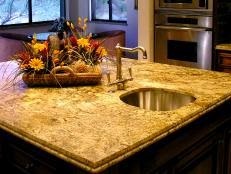 Riding a wave of popularity for the last several years as the surface for countertops, granite is available in several grades, generally 1 through 5 (ratings depend on where you buy it), patterns, colors and thicknesses. Depending on what you choose, a slab can cost you anywhere from $25 per square foot for modular pieces of very basic stone purchased at a home center to upwards of $1,000 per square foot. Thickness can really drive up the cost. If you want granite on a budget, you might consider a three-quarter inch thick slab rather than an inch and a half slab, where you’re more likely to get your money back at resale. Engineered stone. These are your quartz surfaces composed of 93 percent quartz particles and available in a larger range of colors than granite. Prices are comparable, sometimes more. The nonporous surface resists scratches and stains, and manufacturers generally offer a warranty. Brands include Cambria Quartz, Silestone, CaesarStone, LG Viatera and DuPont Zodiac. Soapstone. These pewter-toned countertops are ideal for historic renovations, such as this one by Superior Homes. They darken over time and require regular maintenance with mineral oil applications, but people like the smooth feel and rich character. Ceramic tile. You can lay it on the floor, wall and, yes, countertops. You can recover an existing surface, which appeals to DIYers. And with a wide range of colors and textures available in tiles today, options are seemingly endless. But remember, tiles do crack. And perhaps the biggest down side: tiles require grouting. Concrete. 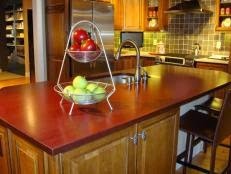 Cast concrete counters can be poured to suit countertops of all shapes. They can be cast in the kitchen, or produced off-site and installed after the fact. The great thing about concrete is its durability. Plus, today’s concrete is even stronger because of treatments that eliminate cracking and seal the surface so it’s less porous. This style suits a modern kitchen—concrete can be dyed a range of colors. Stainless steel. This industrial-strength surface provides a sleek finish in modern kitchens. It’s easy to clean with soap and water, and it takes hot pans, no problem. But stainless steel can scratch and dent, so you can’t cut on stainless. Plus, it’s a costly surface. You might decide to use stainless in a certain area of your kitchen, such as a dining area or by the range.